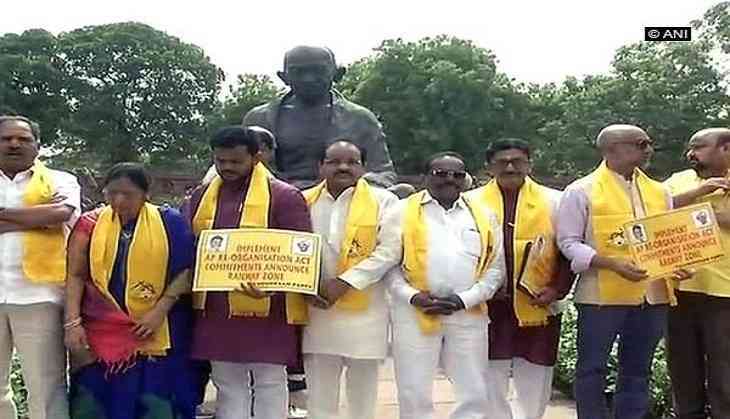 Telugu Desam Party MPs on Thursday staged a protest in front of the Gandhi statue in the Parliament premises, demanding special status to Andhra Pradesh. On the first day of the Budget Session, scores of TDP leaders were seen holding yellow placards and flags displaying their various demands, which include financial assistance to the state capital, Amravati. Yellow is the colour of the party flag. "In 2014, when our state was bifurcated, we had put forward 20 demands. But the BJP government has miserably failed to fulfil our demands. The Prime Minister (Narendra Modi) himself had given us assurance," said a TDP MP. The TDP had also held protests during the Winter Session of Parliament in December last year to press for their demands. At present, as many as 11 states--Assam, Jammu and Kashmir, Nagaland, Arunachal Pradesh, Manipur, Sikkim, Himachal Pradesh, Meghalaya, Tripura, Uttarakhand and Mizoram--have been granted financial aid under this category as a majority of these regions have hilly-terrain and have a considerable tribal population. The responsibility of allocating the funds to special and general category states which are based on Madhav Gadgil-Pranab Mukherjee (1969) formula is on the shoulders of the Central government. The Budget Session, which commences on Thursday, is to conclude on February 13 with 10 sittings in total.